When it comes to composting, Starbucks sees the benefit of using their excess waste as an excellent way to aid garden-growers. Composting with any type of coffee grounds can be quite beneficial to your gardens if used in the proper strengths. Depending upon what is growing in your garden, check with your local garden experts as to proper mixes. This material is so useful, yet acidic at the same time. Too much of a good thing can often work in reverse so be sure to not go overboard. Coffee-grounds-compost is very rich in nitrogen, and generally helps to speed up the composting process overall if mixed with other compostible materials like straw and leaves. At the request of Starbucks back in the 1990's, a study was done to determine what coffee grounds are actually made of. The analysis found them to be made up of certain nutrients such as nitrogen, potassium, calcium and magnesium. There are other beneficial elements too but in small quantity. People commonly mix their left-over brewed coffee with water to make a great fertilizing liquid and "water" their houseplants as well as their vegetable and flower gardens. The grounds can be directly mixed into the soil for houseplants. I sprinkle mine in and around flowers and in front of my rhubarb to keep out slugs and snails. Caffeine apparently has an effect on their nervous system. Well, we all know why we need our jolt of caffeine in the morning, so I can just imagine how it affects a snail. At any rate, they don't like it, and will avoid coming anywhere near it. As the caffeine has an affect on the snails, it can also have an effect on the beneficial-insects in your garden. Don't overdo it. Dilute well. You can also use your blender to mix up and puree your coffee grounds and kitchen scraps together to feed your plants. Some people swear it gives their plants a quick growth spurt and greener glossier leaves on their plants. Since Starbucks generates coffee grounds daily in huge quantities, it became a policy to offer them to the public as compost material, and is known as the "Grounds for your Garden" program. It is a wonderful policy and not many people are aware of this online-community-composting information. What a great contribution to recycling. Just before it rains, coffee-grounds can be sprinkled in and around shrubs and plants. This will slowly release the nitrogen into your soil. You can also include tea-bags in your coffee compost brew. Make sure it is well diluted with water. Having a tub outside that collects rainwater and adding coffee to it any form ensures a "big drink" ready for the plants at all times. 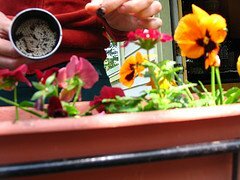 Not only can you directly throw coffee grounds on your compost pile, you can mix in the coffee-filters too. This is great for heating it up, and it doesn't hurt the compost itself at all. So, before you throw out the grounds from your everyday pot of coffee, think about returning them to your garden. And in the meantime, check out your local Starbucks coffee shop. Ask if they have a policy in place at their store to give away free coffee grounds to gardeners. If you personally don't drink coffee, ask any restaurant or coffee-shop for that matter for their coffee-grounds. They probably would be very happy to give them to you on a regular basis.